During the Colonial Era gold in North Carolina was only found in trace amounts. It wasn’t until the year 1799 that substantial success was achieved, by accident, in Cabarrus County. The first substantial piece was found by twelve year old Conrad Reed who was fishing in Meadow Creek with his brother and sister. He withdrew from the small stream a shiny yellow substance that he assumed to be some type of metal. He brought the nugget home to his father, John Reed, who upon examination declared it as an unknown metal and put it to use as a door stop for two years. In 1802 he took the nugget to a jeweler in town who immediately recognized the “metal” and its value. The jeweler converted the nugget into a gold bar measuring roughly 8 inches long and asked Mr. Reed if he would sell it. Mr. Reed, not knowing the value of the gold bar, sold it to the jeweler for $3.50. In time Mr. Reed found several pieces of gold along the creek bed and in 1803 he found a piece weighing in at twenty-eight pounds. The creek was rich in gold and in the year 1831 the veins of the mine were discovered. In 1848 a sketch of the mine was made by a miner, Colonel George Barnhardt, and he declared the Reed Gold Mine to be the first in the United States. Meanwhile in 1825 several mines were opened within a twenty mile radius of Charlotte. Two of the more significant mines were the Rudisill Mine of Count Ravafanoli, which brought experienced miners from Italy and other parts of Europe and the St. Catherine Mine opened by Samual McComb. These two mines were the most profitable with assays ranging from $24.80 to $72.41 per ton. Being rich in ore, the Rudisill mine was still in operation by the end of the Civil War. It soon became essential that the miners have a local facility for processing the substantial quantities of gold flowing through North Carolina. Unfortunately the U.S. Mint was opposed to the idea and it was several years before a branch mint was established; this delay provided and excellent opportunity for private minters. In 1829 German born Christopher Bechtler, Sr., arrived in New York City with his son August and his nephew, Christopher. A year later they bought a tract of land in Rutherford County establishing themselves in the local community as jewelers and watchmakers. In 1831 the miners’ plight brought enough business to the Bechtler’s that it resulted in a private mint and assay office. The Bechtler mint cast dies for $2.50 and $5.00 pieces. 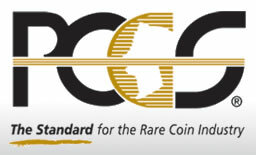 The coins were noted for being 20 carats fine, or 2 carats below the US standard. Bechtler coinage of 1831 bore the words “South Carolina” and “gold”. Coins appearing later than 1834 bore the words “North Carolina Gold”, “Carolina Gold”, and “Georgia Gold”. Bechtler soon had a reputation as a “man of competent science and skill to assay and bring the gold of the mines to a standard value, in the form of coin…he is a man of the strictest honesty and singleness of purpose.” His popularity and reputation allowed for almost ten years of coinage. Bechtler, Sr. operated the mint until his death in 1842 and was succeeded by his son August who was later succeeded by his nephew Christopher. Unfortunately neither August or Christopher had the pristine reputation of Sr., as their coins were often underweight or of dubious fineness. Bechtler gold coins were minted eight years before the first striking at the new federally established mints in Chalotte, NC & Dahlonega, GA in 1838. They were so well accepted for commerce that they became a standard for currency in the south. During the Civil War the monetary obligations of the Confederacy were specified as payable in “Bechtler gold” rather than Union, Confederate, or State currency. 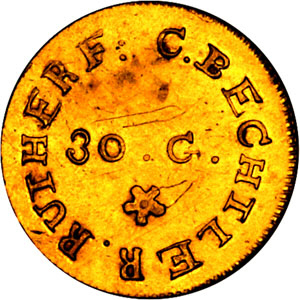 Today, Bechtler coins are rare and command high prices, especially those minted prior to the Coinage Act of 1834 which increased the value of gold by more than six percent which resulted in a massive melting of gold coins, Bechtler’s included. They are considered the crown jewels of any southern mint type set.